A group text sent to the wrong phone number led to a touching moment at a Florida hospital—and a new pair of friends for a newborn boy and his parents. "We are at the hospital. Having a baby today!" a text sent to a Tallahassee man read, "She has dilated to between 5-6." "Congrats lol but I think someone got the wrong number," Dennis Williams and brother Deorick wrote back. Apparently the sender didn't get the note, responding back with a photo of the and newborn being cradled by a woman. "Well I don't know y'all but me and the boys will be thru to take picture with the baby," Dennis wrote back. This could have easily turned into something creepy—who wants a couple of random people showing up in the maternity ward?—but it actually turned out pretty cute. "[W]hat's the room number Bainbridge hospital right we have gifts," the brothers added. 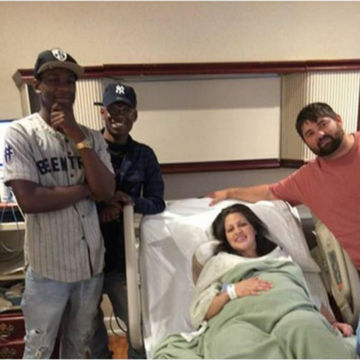 The family apologized for the mix-up—labor can be a stressful time—but they did give the Williams brothers the room number. Soon after, the men made good on their promise with gifts for newborn Cason. They even stayed for a selfie with parents Lindsey and Mark Knox that they later posted to Facebook. And the Knoxes were definitely impressed with the Williams brothers. "What a blessing these two guys were to our family," they wrote on a Facebook post. "They were so sweet and kind to do this! You 2 are great guys and thank you for giving to someone you didn't know! If we all only had this kind of a heart." What a cute story the Knox parents will get to tell Cason someday. Let's hope they all keep texting back and forth—on purpose this time!